Walking on the path next to the beach the other day, I passed by three people sitting on a bench – a man and two women, all in their 20’s, good looking, speaking to each other animatedly, all talking at the same time. I slowed as I passed them to see if I could identify the language they spoke, a game I often play with myself. 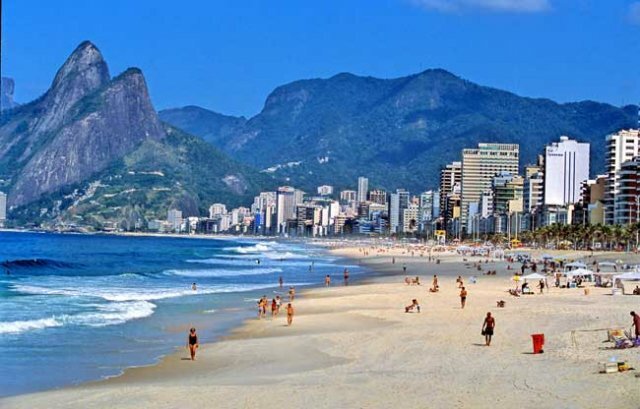 As soon as the sounds came into focus, the lush, round vowels and the soft “shhhh” of Portuguese washed right over me, and I was instantly transported to a beach in Rio de Janeiro. Delicious. Without thinking, I spun around and walked right up to them, smiling, standing, watching and waiting for them to stop speaking. When they did, I apologized for interrupting, and said I just wanted to know which language they spoke. The man said Portuguese, and I smiled and said I’d thought so. I told them I’ve been listening to a lot of Samba music lately (though really more Bossa Nova if truth be told), and the sounds of their voices made me feel like I was inside one of those songs. As I spoke, I swayed back and forth, and they laughed, which made me happy. I told them I think Portuguese is one of the most beautiful languages in the world, and they all smiled broadly. The two girls said “Obrigado” — thanks. I asked them to repeat the word, said it back to them with another smile, turned and continued along on my walk. My, that felt good. To just show up and be in the world, to interact with strangers and share a moment. Let’s have more of that.